"Moooommmmyyy! Moooommyyy! The tooth fairy didn't come yet?" Eyes pop open...I look at the clock. Yep, I was happy it was 3:30 and not the real "time to get up" morning. I pop out of bed and head to Jules's room. "The tooth fairy didn't come yet! The tooth fairy didn't come yet! Maybe she is not coming." I am exhausted but have to get myself out of this...I created it. and quickly became OBSESSED with this second tooth falling out. She was incessant, insistent, and persistent all day about getting this second tooth out. It was not ready...almost but not quite. I could not take it anymore...I had literally told her that the tooth was "still there, and the tooth fairy is just waiting" 100 times! 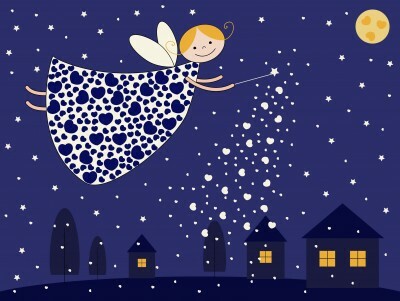 Finally in an effort to divert her attention, I suggest she write the tooth fairy a note or draw her a picture just to let her know you are excited to see her again soon. This excited her...but then it turned into an obsession. By bed time she had decided that the tooth fairy would be receiving one beautiful original piece of art (by Jules), one pink swirly bouncy ball, one penny, and one dime, so that the Tooth Fairy would not forget about here. until 3:30 when she woke up, distraught. And when Mommy realized she forgot to tend to her duties. sat down at about 4 am to craft a response from the Tooth Fairy. Just what I wanted to do at 4 am! 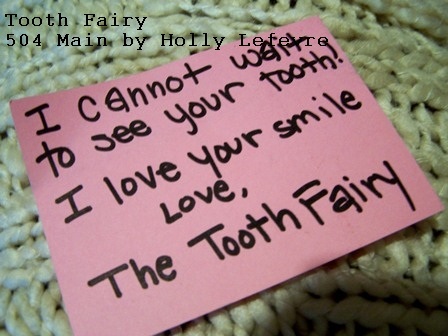 the Tooth Fairy note and went back to bed. and around 6 pm started preparing another offering for the Tooth Fairy (yeah!). 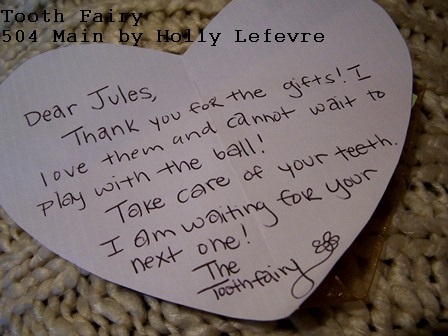 a note that says "I love you Tooth Fairy,"
(to add to the first night loot of a bouncy ball, penny, dime and picture). She is much happier than she looks! So, this is what I do as a mother...I come up with creative solutions to my kids obsessions and problems and, in turn, create, more work for myself...but to see their eyes light up and to hear them tell the stories over and over...there is nothing like it. It is a good reminder of the simple, sweet and magical moments that make you thankful you are a Mom! What crazy things do you do as a mom? Only a mom would go to that much trouble. And that nonsense is the reason my son (at six) thought that the fireworks he saw on his first solo plane flight were somehow engineered by me to mark his arrival back home. sounds like that Tooth Fairy is getting a pretty sweet deal! How precious... Thanks for sharing this sweet story. Good for you for doing that at 4am! I may have gone The Creative Girl's route and dreamed up a layover gone wrong in Mexico. LOVE both approaches! This is precious, Holly! You are such a great mom. :) I hope I remember to be creative with my boys when they need solutions like this! If your daughter's tooth holds on long enough, you can just give her back all the money she has been leaving the Tooth Fairy and she will think she is rich! such a sweet story, and one i'm sure you'll tell her in many years to come. our tooth fairy leaves cheeto's foot prints on the pillow. lol! and st. patrick's day is a total hoot, as the leprechauns come out and are VERY playful! Oh Holly, 3:30 or 4 a.m. is sometimes the hardest time to be a mom. You are a memory making mom for sure. What fun to see the notes and have those stories to tell. So cool. You rock! I'm That Mom who forgets her tooth fairy duties and has to make up excuses for her slacker-ness. 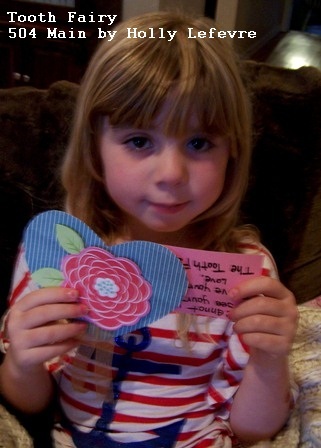 Wow, kudos to you for getting up and out of bed at 4am to craft for your child! I think her offerings to the Tooth Fairy are so precious. How did that start? My son is almost 5 and I think that giving up toys (albeit random) in exchange for a simple note is an excellent way to express gratitude. hahaha Oh the lengths we go to as moms!! I've forgotten too and had to do the..."hmmm did you check ALLLL under your pillow" while sneaking a $1 in. I haven't gotten to the tooth fairy yet. However, I recently allowed my husband to turn a turtle loose on the kitchen floor for the kids. Does that count? Cute story!! !